The new Marcus mini-Dublin pipe is a tip of the hat to Mr. Samuel Clemens, who was a famous story teller, author and smoker. Sam not only smoked cobs from the Missouri Meerschaum Pipe Company, but some even credit him with suggesting the name "Missouri Meerschaum". That may be a tall tale, but what is a fact is this new pipe has done him proud. This is a small version of the popular "Mark Twain" cob and features a genuine hardwood bottom to prevent premature burn-through! It is only available as a Straight, unfiltered pipe. One of my favorite so far. Very cool looking and a perfect size. Beware, the nickel band is not fastened, but actually fits over the factory ferrule. This has quickly become the pipe I reach for most often. Its just the right size and I love the dublin shape. The nickle band adds just the right touch as well. My only complaint is that the stem sets a little higher off the bottom than I am comfortable with but thats nothing some pipe mud can't fix. on 11/19/2016 I'll never buy bigger sizes again....this is perfect! I have settled down to smoking two pipes after all my years of smoking. I've been through big cobs like the General and the Kolonel, as well as the Country Gentleman. I must say......this Marcus, and the smaller Morgan are my two pipes of choice for everyday smokers. This Marcus seems to be about the same size as the Legend or Washington, but better looking. The fit and the finish are top notch! Love the nickel band and the dark stain. This little guy easily gives me a 30-40 minute smoke, and even longer if I take my time. I put a long slender black bit on it to give me more to chomp down on, and it gives me a little distance as well from my face. I just love the Marcus and the Morgan. My 2 favorite pipes ever! Who needs a huge cob pipe when these smaller ones fit the bill so well? 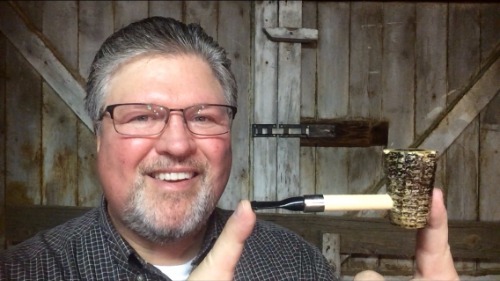 Thank you Scott and Aristocob for your great service and your passion for cob pipes! You have a customer for life! Although it smokes perfectly and the build quality is ok I noticed that the shank is inserted really off center which makes it look a bit odd when you look at the bowl from the top. Personally I was surprised that it passed the quality test of Missouri Meerschaum and wasn't sold as a "second choice". Nevertheless I replaced the bit with a longer bit and it has a perfect draw, smokes nice dry and cool so I can live with the fact it doesn't look perfect.